56 y/o male who presented with 12/10 severe chest pain starting at 3AM, radiating to his upper back. He had a history of pulmonary embolism but was no longer on coumadin and states the pain is different. There is sinus rhythm with RBBB. There are upright T-waves in V2 and V3, with a slight amount of ST elevation in V3. 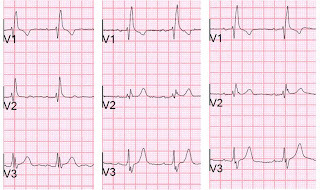 In RBBB, T-waves are usually inverted in V2 and V3, with some ST depression. (See ECG below) Any ST elevation is abnormal. There is also some STE in lead II, and insignificant STE in III, without any reciprocal ST depression in aVL. There is increasing ST elevation in inferior leads without ST depression in aVL, and dynamic T-waves in V2 - V4. Not much change from 15 minute prior, but abnormalities are persistent. It is now clear that there is cardiac ischemia. Inferior? Anterior? Both? Wraparound? The patient was very hypertensive and had back pain, so they did a CT of his chest to rule out dissection. It was negative. Because of the dynamic T-waves and crushing chest pain, he went directly to the cath lab where they found an open wraparound LAD with a large dangerous thrombus. The peak troponin I was only 10 and the patient did well. Serial ECGs and close attention saved his anterior wall. 1 - 0943 has precordial leads annotated with r (V3-V6). Was this actually a right sided ECG or are the annotations erroneous? 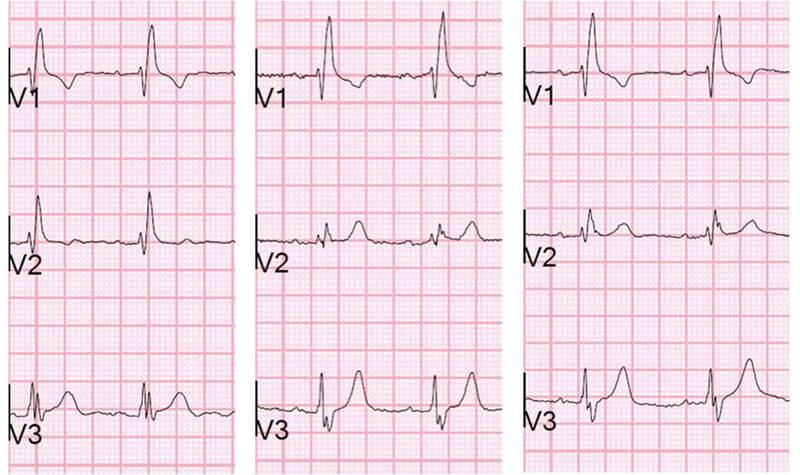 2 - I see the dynamic T-wave changes in your comparison of earlier ECGs. However, I suspect V1 and V2 are switched between 0942 and 0943, perhaps in error while the ECG operator was recording right precordials (Or is it correct to invert all precordial leads, IE V2 in place of V1?) Could you confirm the lead placement? I ask because V1 at 0942 appears identical to V2 at 0943, and V2 at 0942 appears identical to V1 at 0943. Well that was embarrassing! I didn't notice that that was a right sided ECG. I couldn't explain those T-wave inversions and was confused. Now it makes sense. So I just deleted that ECG. As for the first 3, there is no lead placement issue. Those are dynamic T-waves and QRS. Thank you very much for sharing this case. I noticed that you wrote 'There is increasing ST elevation in inferior leads without ST depression in aVL'. Is this a common occurrence (perhaps in the setting of RBBB)? I am under the impression that subtle reciprocal ST depression usually occurs prior to inferior ST elevation. But it's not so in this case, even though ST elevation is increasing. Why? Hope to hear from you soon. Thank you. I do not know why there is no reciprocal ST depression in aVL. It is surprising! Is This a Simple Right Bundle Branch Block? Repost: what is the diagnosis?